The new Triton phono preamplifier offers outstanding performance at a modest price of $995.. With four different gain settings (35dB, 45dB, 55dB, 65dB), eight resistive loading options and four capacitance settings, the Triton will sound stunning with almost any cartridge ever produced. All of the loading options are accessible through a convenient hatch plate in the cover making fine tuning of your setup a snap. 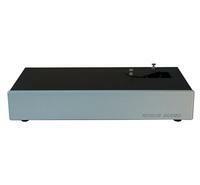 High performance low noise outboard mm/mc phono section suitable for almost any phono cartridge.